Thanks for following along with the Breaking Ground Blog tour. Take a look at these pocket details! 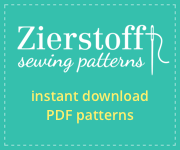 To make the tour even more fun, our Breaking Ground blog team member, Gail is offering 2 patterns of choice from her pattern shop Flosstyle to one lucky winner. We’d love to see how you’re Breaking Ground this month. Share with us what you’re working on by using the hashtag #BreakingGround2018 across social media. Better yet, join the Sew Alongs & Sewing Contests facebook group to sew along with the Breaking Ground theme for the entire month of March. In the group you’ll find support and encouragement for your projects and fun themed challenges.